As you can see most Havanese can deal with the snow. Most Havanese don’t object to a winter walk, sledding with the kids or joining in on the snowball fight. There are some things you can do to maximize your Havanese dog’s comfort and ensure their safety while enjoying the winter months. Puppy cut: Make sure the groomer gives your dog a longer puppy cut.A couple of months with a longer coat shouldn’t increase your grooming time that much. Dog’s coats naturally provide insulation from both heat and cold. Paw pads: Ask the groomer to not cut the hair too short between the pads. The hair should be long enough to provide a barrier between ice and snow. Those who live in the city may find that the cold concrete and salt can be pretty harsh on their pups paws and may want to consider using a natural paw wax. Coat: Consider a coat. I know what some of you(guys)may be thinking, So I’ll just say this, imagine having to crawl on the cold sidewalk when it’s 10 degrees in the morning. You do not have to dress your dog up if that’s not your jam. Just have a coat on hand for those really cold days. Keep track: When letting your dog out during really cold weather, be sure to supervise him. We just open our door, so it helps to put our stove timer on, just to be sure they are not out longer than they need to be. Our mornings can get pretty busy and it’s good to have a reminder in the midst of it. Crack the car window: Dogs are not necessarily safer in a parked car because it is winter. If you must leave your dog unattended in the car, even for a short period of time, crack the window or open the sunroof. Dry flaky Skin: Dogs, like people tend to develop dry itchy skin during the winter months. A simple humidifier can greatly reduce the dry air in your home. You can also add salmon oil or homemade plain bone broth to your dog’s food.For more immediate relief you can give your pet a conditioning bath. Place 1/4 cup of conditioner into a plastic storage container or your sink and fill 1/2 way with water, mix. Place your Havanese in this bin and using a cup pour the conditioner mixture slowly over them for as long as you like 5 mins is good, rinse and wrap in a warm towel. If possible allow him to air dry. For this specifically, I recommend using a high-quality canine conditioner. If you are not comfortable bathing your dog, ask the groomer for a deep condition treatment. Snowball dog: After a romp in the snow, your Havanese may have collected a bunch of snowballs on his coat (like Jett pictured above)The best way to remove these is to fill the bathtub or sink and use warm water to melt them. You can dry him using a blow dryer on warm setting. This is perfect snuggle time for our Havanese. Poisonous winter plants: It’s best to just avoid having these plants in your home but if your pet travels with you, there is the chance you could encounter a situation where your dog is exposed to toxic plants.Here is a list. 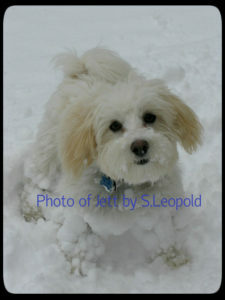 Snow removal: Make it a rule to keep your Havanese inside or secured when snow blowing or plowing. Make a plan: think about what you would do in the event that you lost power and had to leave your home. Be sure to have copies of your dog’s License and/or rabies. Id tags and a crate readily available.